Mimicking the life cycle of its own shape-shifting antagonist, the cinematic adaptation of Stephen King’s 1986 novel arrived 27 years after the fondly remembered (but flawed) TV mini-series incarnation. In another spot of pin-sharp timing, the movie joins an enduring wave of 80’s nostalgia, just as King’s book coincided with a cycle of popular movies and TV shows set in the 1950’s (including his own “The Body” / STAND BY ME). IT 2017 even casts Finn Wolfhard from Netflix’s hugely popular STRANGER THINGS as the relentlessly wisecracking member of the bullied bunch of Derry, Maine misfits who face constant threat from a gang of mulleted bullies in Anthrax T-shirts and from the evil, manipulative force that most commonly takes the form of Pennywise the clown. King’s book arrived in the middle of the post-ELM STREET rubber-reality horror fad, and the movie’s episodic series of FX-heavy, often surrealistic set pieces echo the Freddy era, even down to Pennywise’s uncannily widening mouth. Pruning the clumsier (and more prurient) aspects of the novel and smartly reducing the exposition that takes up so many pages, Muschietti’s handsome, extremely well cast movie makes the right decision to focus on the terrorised ensemble characters in their youth – though only officially reveals its status as “Chapter One” at the very end. 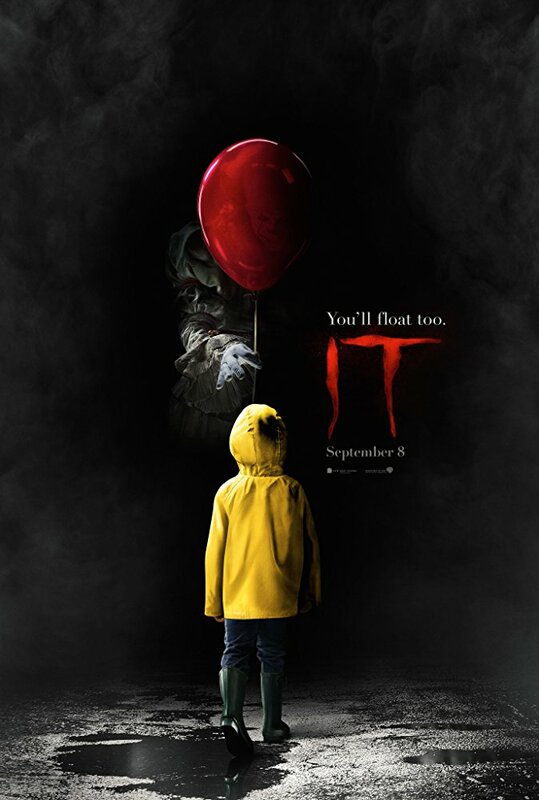 THE GOONIES / MONSTER SQUAD vibe of the kids’ interaction is terrific, though the movie also scores high with its horror: Bill Skarsgard (hitherto best known for HEMLOCK GROVE) delivers a truly disturbing physical and vocal performance as one of the modern genre’s most iconic characters, immediately erasing potent memories of Tim Curry’s own excellent take on the character. The movie is soft and sentimental at heart, with the 2017-styled pacing giving preference to post J-horror style overt scares rather than subtle chills. That said, two comparatively quiet set pieces (an unnerving scene in a library and Pennywise’s gradual invasion of a slideshow) are highly effective, and the faithful recreation of the most frightening scene in the book – the very first scene, with the line everyone remembers – is genuinely alarming. Dynamite score by Benjamin Hallfisch, making suitably unnerving use of the favourite childrens’ ditty “Oranges And Lemons”.